The Rainbow Tick programme is a continual quality improvement programme designed to help an organisation ensure it is a safe and welcoming workplace for employees. The process involved covers an evaluation of relevant documents and focus groups. These data are then assessed and used to generate an evaluation report. The standards against which organisations are evaluated are based on current international best practice in this field. 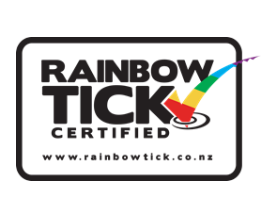 We're proud to say we've met the standard required to be certified with the Rainbow Tick. Creating a workplace where people are free to be their authentic selves is acknowledged to be a central factor in attracting and retaining the best talent. While the areas of gender balance, ethnicity and ability have been the focus of most Diversity and Inclusion programmes, the Rainbow Tick addresses that of sexual orientation and gender diversity. We have drafted Gender Identity and Sexual Diversity guidelines. Our Board supports these guidelines, management ensures they are followed, the diversity committee undertakes to provide regular training and human resources provides support and advice to employees transitioning and their managers. We have a sincerely positive and engaged attitude to supporting Rainbow staff in our workplace and engaging in the Rainbow Tick process- which was started on the recommendation of Rainbow identified staff members. Because of our geographic difficulties, we have face-to-face training at our more remote sites and online training is made available. We have Rainbow flags that we display at our asset sites (dams and wind farms) for days of significance (IDAHO, Pride). Our staff wear lanyards and all those who wish can choose a Rainbow lanyards to replace the standard issue black. In our job interviews Meridian’s stance on Diversity & Inclusion is always mentioned. To celebrate us achieving the Rainbow Tick, we held a celebration in each of our offices, with rainbow cake, the rainbow tick certificate, and rainbow lanyards.